HomeGold IRA BlogGold IRAWho Will Replace Janet Yellen At The Fed? Who Will Replace Janet Yellen At The Fed? 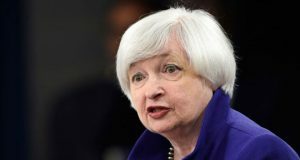 Janet Yellen appears to be on her way out as head of the Federal Reserve, and all eyes are on a shortlist of potential replacement candidates, particularly those with pull in the Trump administration. Each Federal Reserve chair serves four-year terms, and Yellen’s expires in February 2018. It appears President Trump carries a shortlist of candidates to serve as the next chair, and pundits expect an announcement in October. Whomever the President selects will play a critical role in setting U.S. monetary policy for the next four-plus years. This means either continuing the Federal Reserve’s nearly decade-long, low-interest rate policy or changing course, unwinding the Fed’s balance sheet and slowing inflationary pressure on the economy. It’s still too early to rule out any surprise players. That said, the following names are firmly in the conversation for next Fed chair. If the President is serious about easing financial regulations and adopting a more hawking monetary policy, Warsh is the likely pick. In the past, Warsh frequently blasted the Bernanke and Yellen for tampering with the stock market too much and for worrying about declines in valuations. that a deflating stock market bubble, even if done responsibly, could reflect poorly on his economic agenda. Cohn is considered a relative unknown, despite his public stints as president of Goldman Sachs Group. Many experts think Cohn could be as dovish as Yellen, or even moreso, which could be a worrying thought for the broader economy (but creating a silver lining for gold IRA owners). What we do know is that Cohn wants to roll back regulations on the financial sector—something that aligns with both the White House and the Republican base. Powell is the moderate on the President’s shortlist. He is also very much an establishment, Washington-focused type with a deep knowledge of the Federal Open Market Committee (FOMC). Other than Yellen, Powell carries the most “professional” economic credentials. Powell never dissented from a Fed position, even when he held reservations about Ben Bernanke’s QE3 (third round of asset purchases) in 2012. He is firmly for post-crisis regulatory reforms. If Trump picks Powell, it would certainly be as an olive branch to Congress and not as a signal of deep change for the economy. During one of his debates with then-Democratic presidential candidate Hillary Clinton, Trump blasted the pseudo-success of the stock market under President Obama. “We are in a big, fat, ugly bubble,” Trump suggested. He added that Yellen’s Fed kept interest rates artificially low—doing “political things”—to prop up the stock market. While candidate Trump frequently criticized Yellen’s stewardship of the Fed on the campaign trail, the 45th President has sung a more modest tune since entering the Oval Office. The newer Trump calls himself a “low-interest rate person.” Latest reports suggest that Yellen remains very much in the conversation. For what it’s worth, Yellen has been much less inflationary than her predecessor, Ben Bernanke. Her tenure at the Fed is one of (extremely) slow tightening and reluctance to engage in further monetary expansion. In late 2017, Yellen vocalized support for selling off Fed assets. The more dovish the Commander-in-Chief and the more hawkish the Fed’s policy, the better news it is for Yellen. As most frequent readers of this blog are aware, the Federal Reserve carries immense economic influence. It has the ability to dictate open market operations, set the discount rate, change bank reserve requirements, and use supra-market asset purchases to reshape the role of borrowing and lending in the economy. Continuation of low-interest rate policies, whether through Powell or Yellen, could send stocks higher and the dollar south. In the short term, this would be a neutral move for gold. In the long term, however, it only strengthens the case for diversifying through precious metals. The “worst” case for gold owners would be Kevin Warsh. As someone who could restore sanity to the U.S. and global monetary regimes, Warsh might decrease the likelihood of a long-run crash (or he might pop the bubble before it gets bigger). In the short run, Warsh would likely portend good things for gold prices. You can own real, physical gold bullion and store it in a tax-advantaged retirement vehicle. American Bullion is here to discuss your options and help you every step of the way. Our #1 goal is to help you take control of your own finances—and we promise to be transparent, safe, and efficient in the process.